Online learning in K-12 classrooms has gotten some bad press recently. 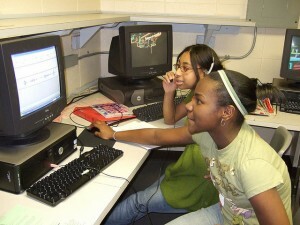 The articles portray low-quality computer programs replacing teachers in a short-sighted effort to cut costs. That simplistic portrayal does not address the whole picture. "It's a lot more complicated than that," says Cheryl Vedoe, CEO of Apex Learning, a digital curriculum provider in both traditional and virtual classrooms. For one thing, saving money is not the priority for more schools. Arthur VanderVeen, CEO of New York City's iZone, for instance said that "cost savings are not the first appeal here. They’re not that real. If student-teacher ratios are the same, then [costs are] no different." At iLearnNYC, the iZone's online learning program, costs are the same. That may change in the future, though. There may be other cost savings, VanderVeen says, when "digital resources become cheaper than textbooks and when users and schools can create their own content." Also, "a school that might offer a class to a small number of students can now aggregate students from across schools" for that class. I asked Apex Learning's Cheryl Vedoe to talk about the specifics of online learning: the costs, when it works, and what makes it successful. Q: Do online courses reduce costs for schools? A: There are several different aspects to that. In a virtual school environment where students are at a distance from their teacher, it is often the case that an online teacher is engaged with an average of 180 students each semester. That sounds like a huge number, but a typical teacher in a high school teaches six class periods per day with average of 30 students per period. That actually adds up to 180 students. You have to be careful about the data a little bit. It’s true that an online teacher will be working simultaneously with 180 students, but so will a classroom teacher. The other thing about reducing cost: Nationally, we have a dropout rate of 30 percent, and approximately 50 percent of students who go on to college need remediation. The reality is a teacher in a traditional model is challenged to help every student in the class be successful. A digital curriculum can help teachers more effectively individualize learning. Where do the cost savings come in? You don't need remediation programs, credit recovery programs, after school, or summer programs at the same level of magnitude. So, we do think there’s opportunity for cost savings here, but it's not necessarily by having one teacher teach more students. It's by supporting the teacher in being more effective with a higher percentage of students. Q: How does digital learning differ from traditional learning practices? A: I think the most significant factor is that when students are engaged in a digital curriculum they are having an individualized experience. Teachers have a set of standards they have to cover and they have a set time period in which they must cover it. With a textbook, every student is doing the same thing every day. The teacher, out of necessity, teaches to the middle of the class. The kids who could be accelerating have to be held back, and the kids who need more time to be successful don't have that time. Struggling students in a typical classroom just get lost. They can't keep up. Approximately two-thirds of high school students are below proficient in reading and math. You’re going to have a number of students in your class who need more support. A single teacher doesn’t have bandwidth to do that. And if a student is capable of accelerating and can't, they become bored. In an online course, you can have individualized pacing. You're able to integrate media to incorporate different learning styles, such as audio, video, and animation -- multiple ways in which to learn and master a concept. For a traditional classroom teacher who's teaching six classes a day at 30 students per class, I really question whether it's a realistic expectation to ensure the success of all students. Q: Is there an age that works best for online learning? A: If you look at what's being done in elementary versus middle and high schools, you'll see different uses of online learning. In high school, comprehensive online courses are a good fit. At Apex Learning, our focus is on high school and on supporting middle school students in the transition from middle school to high school. But 300,000 students enrolled full time in virtual schools last year and 80 or 85 percent of the students in full time virtual charter schools are actually K-8 students. The smaller percentage are in high school. Q: Are online courses less rigorous than traditional courses, as the recent New York Times article implies, particularly when it comes to credit recovery? A: Different school districts take different approaches to credit recovery. Credit recovery is not new, but in the past the only option schools had was to have the student repeat the course. This was typically unsuccessful. If they failed it the first time, they might fail it the second time using that model. But they might succeed in a different model. Online courses provide an individualized experience. Students can go quickly through the material and only take time when they need to work on specific skills. On the question of rigor: Our courses are often viewed as too rigorous by the schools. One of the things the New York Times article pointed to was that the student wasn’t required to a read a work of literature. We do require that, but school districts don’t always choose to implement the entire curriculum. So, implementation can make a big difference. Q: How would you respond to the assertion that online learning replaces teachers with technology? A: I would say that it depends on the online courses and the implementation of the online courses. There are models in which that is exactly what happens. Not all online courses are the same and not all implementations are the same. For example, when we design and develop our online courses, we assume that there is a highly qualified certified teacher actively engaged with students. Our courses are in no way a substitute for a teacher. What they do is change the role of the teacher somewhat. We once thought of the teacher as standing up in front of the class and delivering content and handing out quizzes and grading work. But what a teacher does while teaching an online course is interact one-on-one with every student, making sure each student is successfully moving through the course. And because of the data available in an online environment, a teacher is able to identify when a student needs help and provide that student with tailored support.